The 2014 Touring Stars, a combination of veterans and new faces, will lead the ARCA Midwest Tour presented by SCAG Power Equipment into a full season of short track racing throughout the Midwest. To qualify for this elite program, competitors must adhere to strict guidelines that ensure the highest quality of driver talent and the strongest level of competition among the Touring Stars. Touring Star positions were selected this year based on a variety of different requirements ranging from; overall past and current racing success, series success and racing stats, years of racing with the Tour and prior Touring Star status. Consideration is also given to how the driver represents himself, his sponsors and the series. "The Touring Star program is something the series has taken great pride in since day one. These are the cars and stars of the Midwest Tour and this allows us to build that excitement for fans that attend their local race track and look forward to seeing their own hero's, "their local stars," battle against the travelers at each event. That's what short track racing is all about and we are proud to bring the best of the best to tracks around the Midwest," said Steve Einhaus, VP. Each of the drivers below has met the criteria and will represent the ARCA Midwest Tour in 2014. Nathan Haseleu, the first ever Midwest Tour Champion, has made every race since the inception of the Tour in 2007; the only driver to do so. He has seven Tour wins, 10 fast qualifier awards, 41 top-fives and 65 top-tens. Two of his victories included the 1st Annual Joe Shear Classic at Madison International Speedway as well as last year's Oktoberfest 100 at La Crosse Speedway. In 2001, Haseleu competed in 12 NASCAR Camping World Truck Series races accumulating four top tens. In addition he has numerous wins all over the state of Wisconsin since the beginning of his career which started in a hobby stock when he was 16 years old. In 2014 Nathan will once again be sponsored by RaceTeamGear.com and The Swiss Colony. Andrew Morrissey, the 2011 Tour Champion, also returns as a Touring Star in 2014. Morrissey has 69 starts, two wins, 16 top fives and 32 top tens since his career began with the Tour. Morrissey got his first win in 2012 winning the Joe Shear Classic. His second win came last fall at Elko Speedway in the Thunderstruck 93. Andrew will be sponsored by Spring Green Health Mart & Pharmacy, DMJ Trucking of Deerfield, WI and B&B Racing Engines. Jonathan Eilen was the 2012 Midwest Tour Champion. He has 73 starts, five wins, one fast qualifier award, 23 top fives and 36 top tens in the series. Jonathan started racing in the Thunder Car division at Elko Speedway where he immediately found success, which continued to follow him as he moved up through the ranks. Eilen joined the Midwest Tour in its first year. He became the first ever winner in the series in 2007 taking home the victory at Elko Speedway. He also found himself capturing the first ever Rookie of the Year honors that year. He will return in 2014 as a Touring Star sponsored by Eilen and Sons Trucking/Landscape Supply's, B&B Racing Engines, and TraLo Trucking. James Swan is the newest Midwest Tour Rookie of the Year, taking home the honors in 2013. He has nine starts and two top tens so far in the ARCAMT. Swan has been successful in anything and everything he has ever raced. Swan has five series championships, including a championship in the Midwest Truck Tour in 2012, his rookie year in the division. He also has countless track championships and victories in various divisions. In 2014, he will be sponsored by Elements by Hankscraft, Durham Hill Auto Sales and DRM Industries. 2014 will be the fourth year that Chris Weinkauf will be with the ARCA Midwest Tour. In his 38 starts, he is fifth in the overall most fast qualifier awards with five. He has eight top fives and 18 top tens. Chris is a State Park Speedway Champion and a winner of the Trickle 99. The Merrill, WI native will be sponsored by Jay VanDerGeest Cattle, Professional Drywall, and Breber Music. Jason Weinkauf joined the Tour full-time in 2012. He has 28 starts, one win, one top five and eight top tens. Weinkauf's first Tour win was an emotional one, winning in front of a hometown crowd at Marshfield Speedway. The driver out of Merrill, WI will once again be a part of the Touring Star program. Weinkauf will be sponsored by Jay VanDerGeest Cattle, Professional Drywall, and Schaeffer's Racing Oil. Cardell Potter will return for his third year with the ARCA Midwest Tour. Potter has 23 starts, and five top tens so far. Cardell is an avid and very successful snowmobile racer. He began his career in 1996. He holds multiple state championships, driver of the year awards and rookie of the year awards. In 2009, Potter was the USSA Ice Oval Driver of the Year. 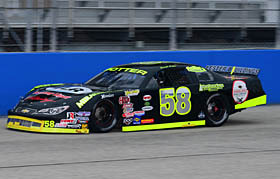 Potter jumped into a limited late model in 2007 and raced at Dells Raceway Park. He was the Rookie of the Year in 2008 and had two feature wins. He started competing in a super late model in 2011 and joined the ARCAMT in 2012. He returns to the Tour as a 2014 Touring Star. Tommy Lipar Racing, Hableman Bros. Cranberry and Advanced Compressor Technology will be Cardell's main sponsors for the 2014 season. Seymour, WI native, Ty Majeski will not only be a part of the Touring Star Program, but he is also a 2014 Rookie of the Year candidate. Majewski has eight starts which include one fast qualifier award in the ARCAMT. He had six National go-karting championships between 2004-2009. In 2013, only his second year in a super late model, he accumulated four feature wins and three fast times racing in four different late models. The 19 year old attends UW-Madison majoring in Chemical Engineering. Majeski will be sponsored by Le Juene Bolt of Lakeville, MN and Ted Mannstedt & Son, Inc Structural Steel Fab of La Crosse, WI. Casey Johnson will join the ARCAMT, not only as a Touring Star, but as a Rookie of the Year candidate. Johnson comes to the Tour with much success already under his belt. The young driver is no stranger to winning. Some of his success includes, a Big 8 Series Champion in 2012, which also included a win at the Milwaukee Mile, as well as a Madison International Speedway Triple Crown Championship. He is a multiple time champion at Jefferson Speedway. He also won a segment of the Trickle 99 at Oktoberfest. Casey will be sponsored by Lein Acres, Hogan Farms and UAW Region 4. Donny Reuvers also returns to the ARCAMT as a Touring Star once again. Reuvers was one of the early drivers in the Tour and accumulated four wins and three fast qualifiers awards in his 35 starts. 24 of those starts were top tens. He finished second in points in 2007, 2008, and 2009. In addition to his Tour success, Reuvers has won countless championships at Elko Speedway and Raceway Park. Reuvers will be sponsored by Short Track Racing Experience, Apple Autos, Lifesprk and others. Boris Jurkovic will join the Touring Stars Program for the first time in 2014. Boris has 13 Midwest Tour starts with two top fives and five top tens. Jurkovic is a veteran driver who has raced all over the Midwest and South in various late model series. Some of Boris's successes include five career wins at the famed Winchester Speedway, including the Winchester 400, six fast qualifier awards, 23 top fives, and 32 top tens in 71 CRA Super Series starts. He is also an Illiana Speedway champion. Boris will be driving for long-time car owner, Mike Butz and will be sponsored by Reliable Recovery Services. Matt Kocourek will join the Tour full-time in 2014. He has 22 starts in the series including one top five and five top tens. Matt holds a championship at Lake Geneva Raceway. He is a short track journeyman with great success. This season he will be sponsored by United States Concealed Carry Association, Five Star Bodies and Perfection Auto Body. The youngest Touring Star in 2014 will be 18 year old Nick Barstad. While he may be young, Barstad has plenty of experience under his belt. His career started in Quarter Midgets in 2004 where he found plenty of success. 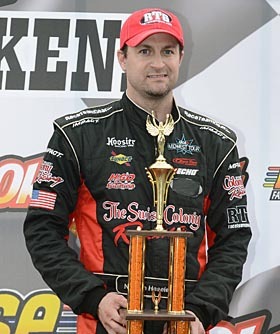 After moving up through sportsman and limited late model divisions, in 2011 Nick became the Rookie of the Year in the NASCAR super late model division. He will join the ARCA Midwest Tour in hopes of adding another Rookie of the Year title in 2014. Barstad will be sponsored by Interstate Truck Driving School, VMS Motorsports, B&B Racing Engines, and Topline Landscape. Joel Theisen returns to the Midwest Tour in 2014. He has 19 starts with the Tour. 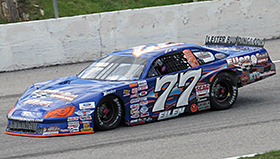 Joel's racing career started at Elko Speedway where he continues to compete. His last win at the track was in 2012. He was the 2006 Rookie of the Year. This year he will be sponsored by Lifesprk, Ruevers Racing, and Educare. In order to better reward participating drivers, the criteria that drivers will have to meet to be eligible for the event bonuses has been refined and the standards have been raised. Touring Star's attendance throughout all 2014 events is mandatory unless excused by the series president and vice president. Drivers that miss an event will no longer be allowed to continue in the program during the same calendar year. As a reward for their loyalty to the Midwest Tour, Touring Star drivers will be provided several bonuses throughout the race season. Touring Star drivers will be awarded one additional provisional during the season above and beyond the current two that are allowed. A bonus payout system has been created. It is based off of the number of cars that enter each race; the more cars that enter the event, the higher the bonus pay out will be, with max payout being at 32 cars. Touring Stars are guaranteed a $200 bonus at each event but can win up to $1000 at each event. All bonuses will be paid out at the following event. Eligible Rookie of the Year contenders who have filed all paperwork properly and are evaluated will qualify for the bonus program along with the Touring Stars. Any positions that become vacant during the year will be filled based on series points. An open 15th position will be available for additional Rookies or future Touring Stars that fall into the position based on their attendance and series points position if no remaining rookies are on the tour. Learn more about the Automobile Racing Club of America Midwest Tour, by logging on to arcamidwesttour.com.